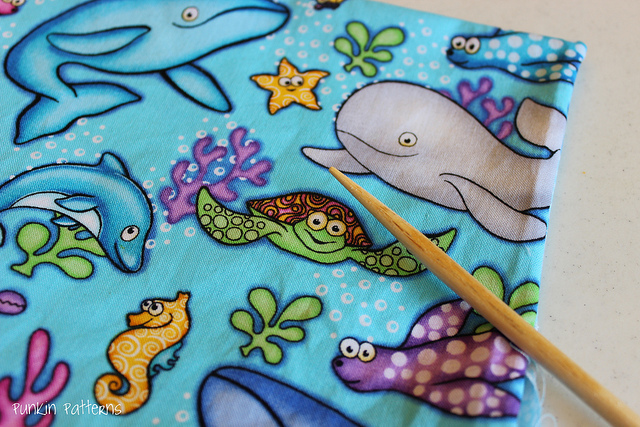 With the kids back to school and now both of them eating lunch there, I thought it would be fun to make some simple napkins for their lunch boxes. 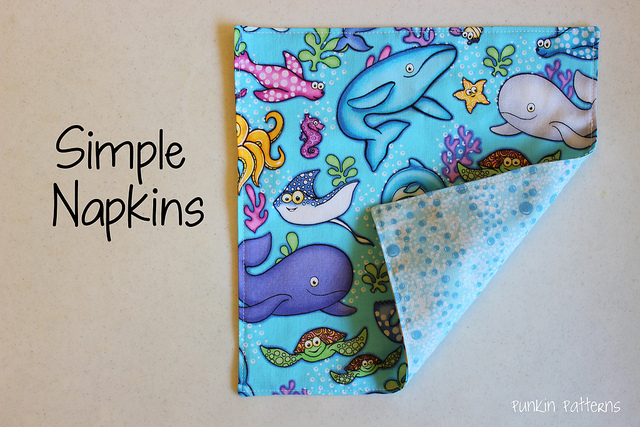 These napkins are very, very easy to make. 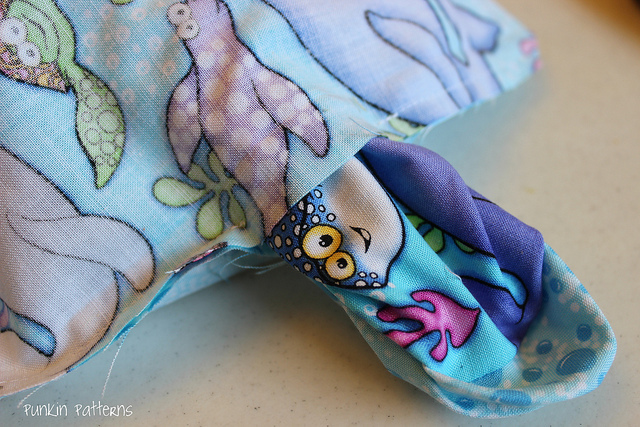 They are a great way to use up large scraps of fabric or just to help reduce your stash. 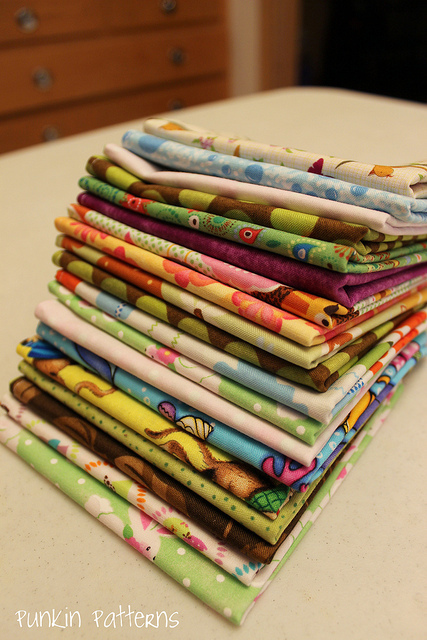 I raided my oldest fabric stashes and used up a lot of fat quarters. (YAY!). Perhaps I got a little carried away. 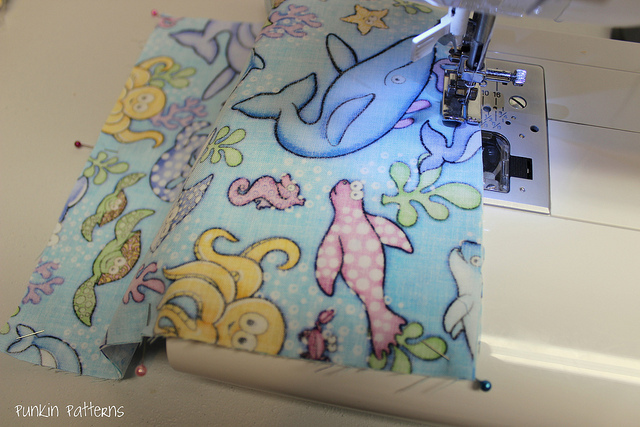 I said they were simple to make and it felt great to use up all of that old fabric. 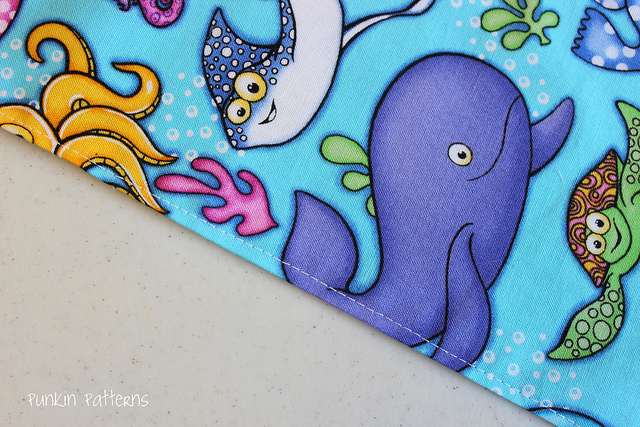 I made two different sizes of napkins: a small 10″ napkin great for daily use (and lunchboxes) and a larger 18″ (17.5″ finished) napkin perfect for entertaining guests. 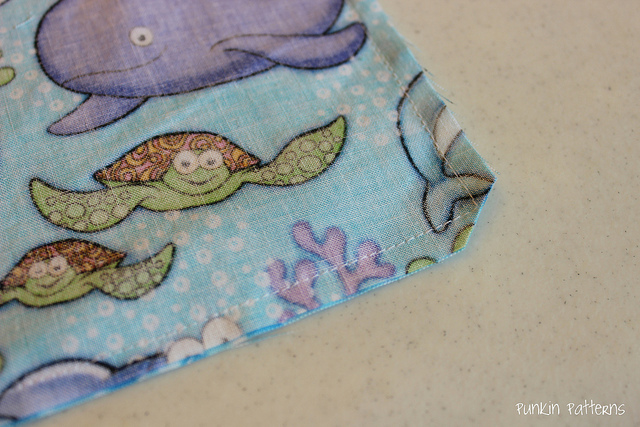 For the small napkins, cut two different pieces of fabric 10.5″ square. 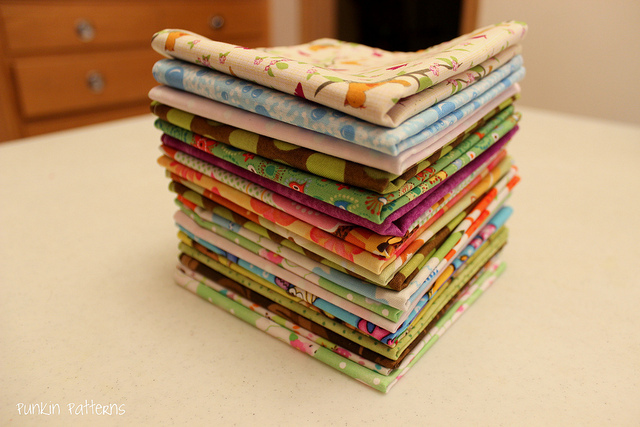 You can cut 4 squares from 1/3 yard of fabric, or one from a fat quarter. 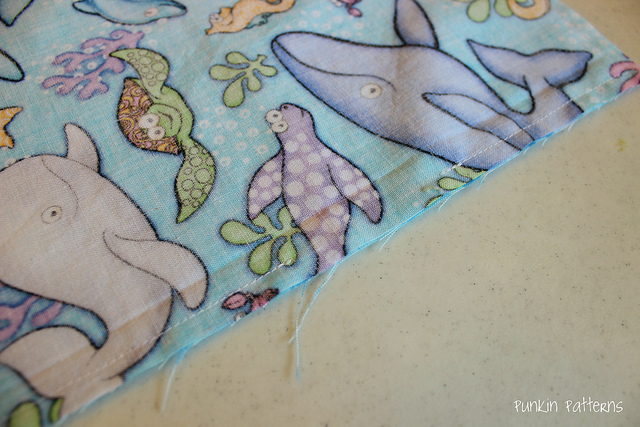 For the large napkins, cut two different 18″ square pieces of fabric. 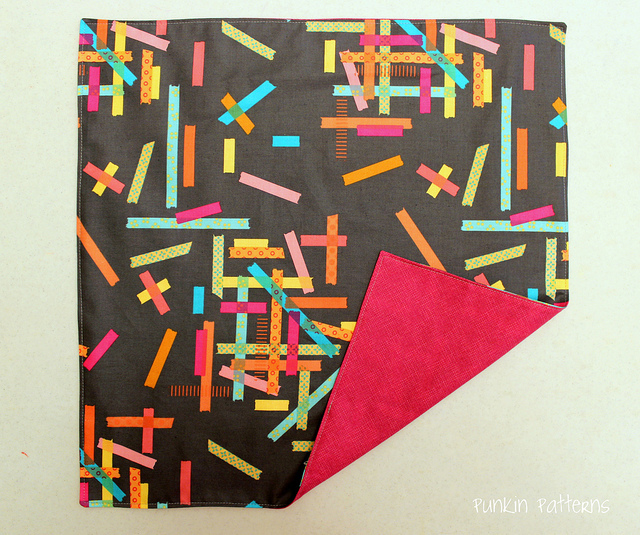 From one yard of fabric you can cut 4 squares. 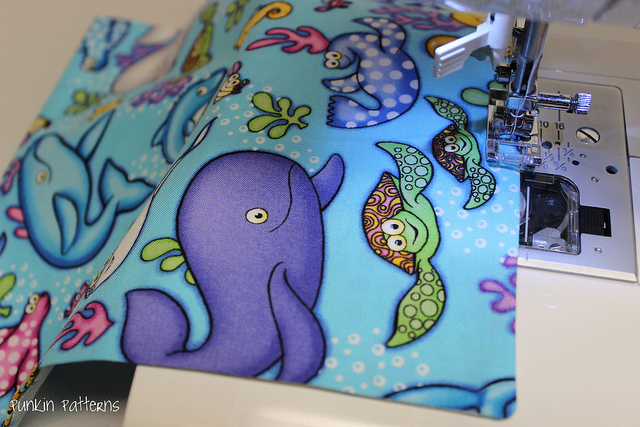 So for a set of four double sided dinner napkins, you will need two one-yard cuts of different fabric. 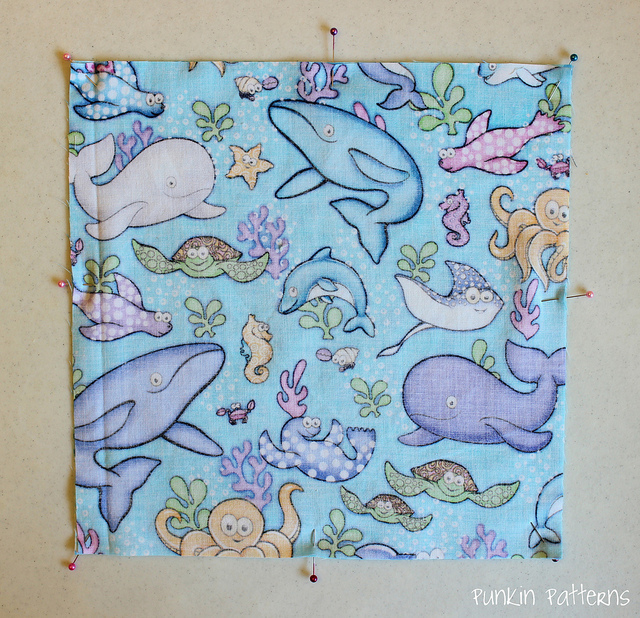 Place your two squares of different fabric right sides together and pin. Turn the napkin right side out. 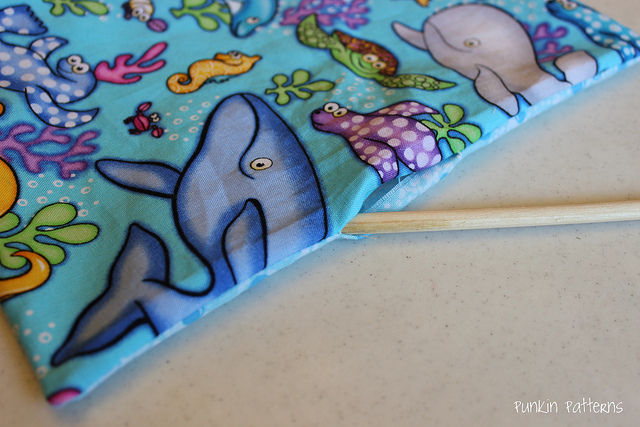 You can use a chopstick or knitting needle to help get the corners poked out and the edges smooth. Iron flat making sure that the raw edges where you turned it right side out are tucked inside and the edge looks smooth. 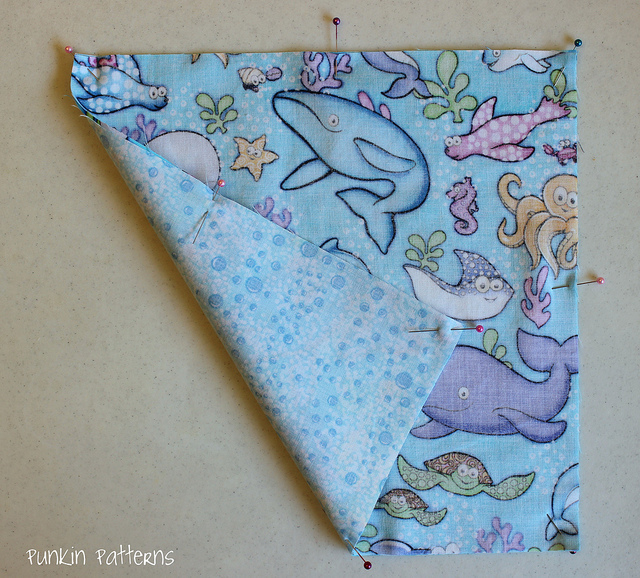 Top stitch (using a slightly larger stitch length) around the edge using a 1/8″ seam. Now repeat for the rest! Super simple and they will really brighten up your table (or lunchbox). I really love my large sets. 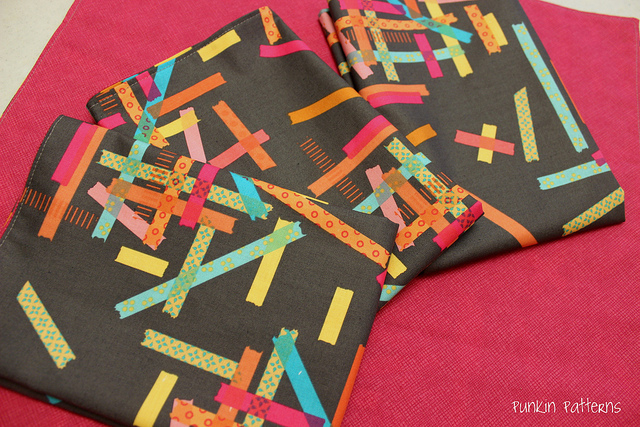 These napkins made from Washi fabric are my absolute favorites. And of course a little Anna Maria Horner on the dinner table isn’t bad either. 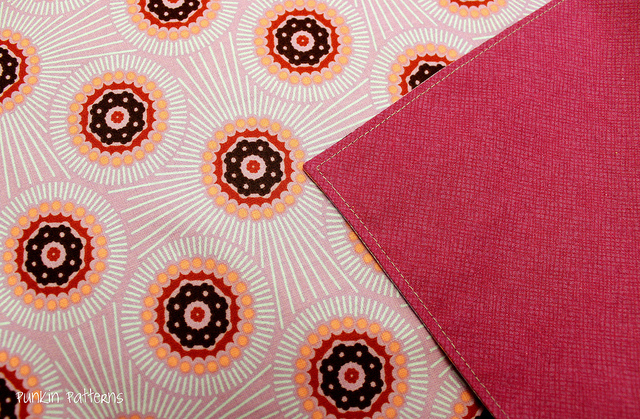 I make placemats about the large-napkin size and napkins about 1/2 the small-napkin size. Sometimes my napkins are double sided. Kids love them in their lunches! 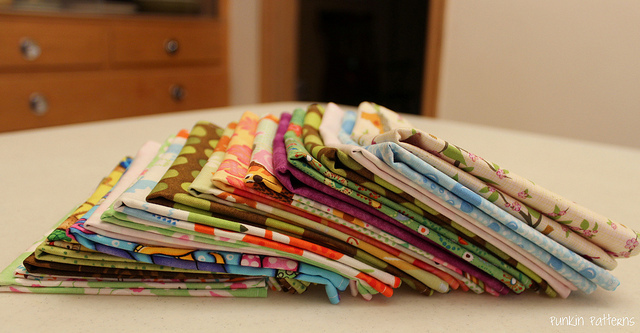 washed,napkins will more likely lie flat. Thanks for the tip. I’ll remember that when I make these. 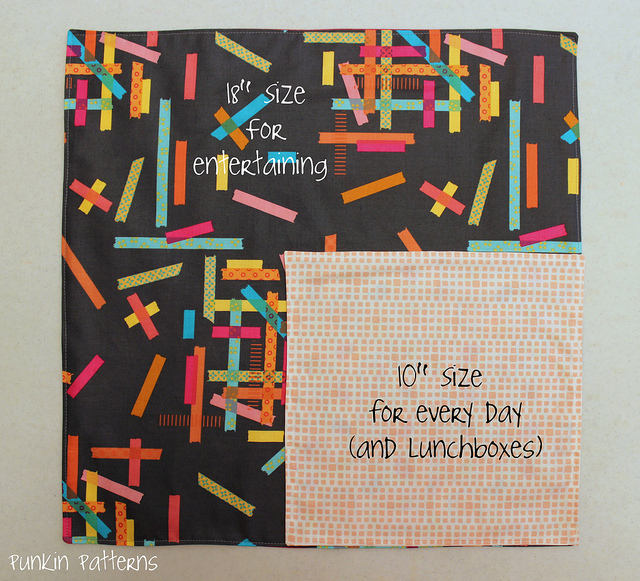 Great idea for lunch boxes! Never would havery thought of it! Also to carry in car, for those who eat on the road. Great gift idea! Awesome Baby! 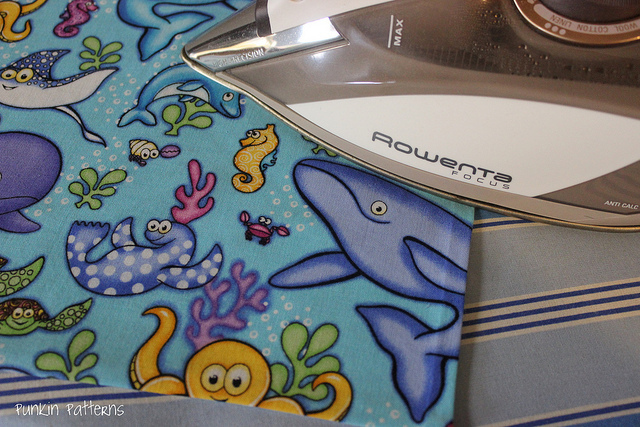 I have been trying to make handkerchiefs for the longest and this just solved my problem thank you so much! I was having problems trying to figure out how to turn the corners so doing it from the inside out works for me thank you again!